Wending its way through southwest Wisconsin and northern Illinois, the Rock River has been a substantial force for growth in our region, once harnessed as a dynamo for powering cities and factories. Today, it continues to play a major role as a precious asset that enhances our quality of life. Beginning in Janesville and Beloit, moving south through greater Rockford, Byron and Oregon, and on to Dixon, Sterling and Rock Falls, Northwest Quarterly highlights some of the best places to play, picnic, hike, bike and celebrate life in a river town. Rock County was named for a large rock, here on the river’s north side, that marked a spot to safely ford the river. Aptly, the county’s first bridge across the river was built here. Today, its 62,500 residents enjoy 2,000 acres of parkland, 200 directly on the river. The oldest is Riverside Park, 2200 Parkside Dr., established in 1922; with 87 acres (without the 18-hole golf course), it’s also the largest. Amenities include a softball diamond, sand volleyball court, wading pool, tennis and shuffleboard courts, horseshoe pits, three playgrounds, two picnic pavilions and grills. In the upper park are three scenic overlooks, and stone steps installed in 1929 lead up to a section of the Ice Age Trail known as the Devil’s Staircase. The Kiwanis Bike Trail goes through here, and a boat launch and fishing areas provide water access. Traxler Park, 600 N. Main St., offers 27 acres of horticulture gardens, boat launches, fishing, sand volleyball courts, an outdoor hockey and ice rink, play equipment and pavilions. It features a veteran’s memorial and walkway, and the Rock Aqua Jays Water Ski Show Team performs here. At 32 acres, Lustig Park, 1500 River View Dr., has disc golf, fishing and a pavilion; and 42-acre Monterey Park, 501 Rockport, has basketball, softball, fishing, and a paved trail. Not surprisingly, community festivals and other events gravitate toward the river. “It flows through our downtown, so businesses and organizations naturally find ways to promote that,” says Rebout. On May 14 & 15, the Janesville Renaissance Faire in Traxler Park will feature performers in Tudor garb; period music; displays of weapons and armor; and skills demonstrations like blacksmithing and calligraphy. Independence Day on the Rock traditionally includes water ski shows, live music, a fishing derby, a Taste of Janesville, the “Anything That Floats” flotilla and, of course, fireworks. 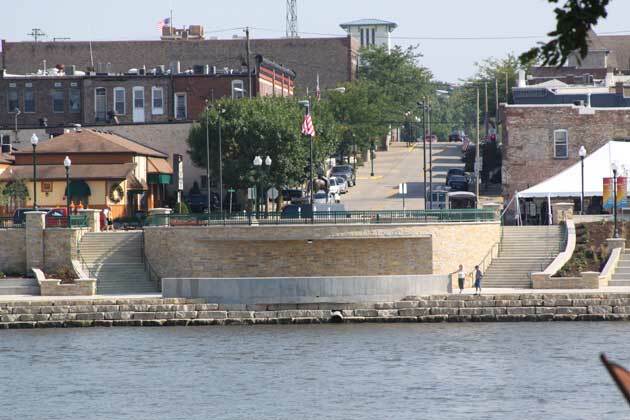 In late August, “Rock Around the Block” is a street festival, sponsored by Downtown Janesville, featuring live bands on up to 11 stages along the river, with downtown merchants offering specials. Last year it drew more than 8,000 visitors. Also in August, The Janesville Noon Rotary Club hosts its annual Corn Roast & Mud Volleyball Tournament fundraiser in Traxler Park. “The river is part of our campaign to show visitors that Janesville is a natural outdoor destination,” says Rebout. The first known white man to live here was French fur trapper Joseph Thiebault, who traded with the Winnebago tribe in the 1800s. Beloit became an official city in 1856. Today, its 17 square miles are home to more than 37,000 residents who value the Rock River both for commerce and leisure. “Downtown is split by the river, and we have many parks along its banks and many events surrounding it,” says Vicki Stone, director of tourism sales at Visit Beloit. The most popular is Riverside Park, 24 acres with a lagoon, on Riverside Drive. Flanked by Portland Avenue on the east and Henry Avenue on the west, it offers playground equipment, a 3.5-mile paved path, lighted tennis courts, two picnic shelters and concessions. The Harry C. Moore Pavilion, or Harry’s Place, hosts free summer music and fun. Visitors can fish or rent paddle boats and tandem bicycles. Also here is the Rotary River Center, a 3,000-square-foot facility available to rent. Turtle Island Playground, located within Riverside Park, has been redone to mirror the adventures of Beloit’s Roy Chapman, the inspiration for Indiana Jones. Kids can wade in the creek, play on dinosaur bones and dig for fossils. Offering beautiful river panoramas is Big Hill Park, 190 acres situated on a bluff at Afton and Big Hill roads. It has playground equipment, picnic tables, grills, shelters, a nature center, hiking and cross-country skiing. Armstrong-Eddy Park, north of the Henry Street Bridge on South Riverside Drive, has a boat launch and small dock, benches, picnic tables and playground equipment. Preservation Park, 3444 S. Riverside Dr., with a shaded area, boat launch and pier, is the site of the annual Midwest All Classics Boat Show in August and the Beloit Autorama car show in September. Wooton Park, 4th Street and Maple Avenue, has a boat launch, docks and riverbank fishing. The new John Rose Canoe & Kayak Launch, behind Chester Square, was named for a high school teacher who started a local canoe and kayak club. The 200-acre Happy Hollow County Park, between Beloit and Janesville at 1731 W. Happy Hollow Road, has a boat launch, riverbank fishing, picnic tables and four miles of trails open to equestrians and hikers. Riverside events are plentiful. In June, Friends of the Riverfront sponsors “Edge of the Rock,” a week-long event in which artists set up easels along the river to paint outdoor scenes. The Fourth of July is celebrated with Pops on the Rock, a riverfront concert presented by the Beloit/Janesville Symphony, followed by a fireworks extravaganza over the river. Beloit Riverfest, in Riverside Park, is scheduled July 7-10 for this, its 25th year. The four-day event features live music from local performers, a carnival midway and food vendors. In 1834, homesteaders settled here along both sides of the shallow, rocky stretch that provided a natural ford for travelers. Until 1837, it was called Midway Village, because of its location halfway between Chicago and Galena. Among these founders were Germanicus Kent, Thatcher Blake, Daniel Shaw Haight and Lewis Lemon, a slave who bought his freedom. Rockford was chartered as a city in 1852. Today, residents in the Rockford region are fortunate to enjoy hundreds of riverfront acres maintained by both the Winnebago County Forest Preserve and the Rockford Park District. The park district was formed in 1909, by philanthropists who thought factory workers and their families should have a pleasant place to picnic on Sunday afternoons. Today, the 77 acres they purchased on the east riverbank are part of a system of 175 parks covering more than 4,800 acres, serving some 212,000 people in Rockford, Loves Park, New Milford, parts of Cherry Valley and various unincorporated areas. Citizens also enjoy nearly 10,000 acres in 40 forest preserves owned by the Winnebago County Forest Preserve, many with Rock River access, such as picturesque Hononegah Forest Preserve, 80 Hononegah Road, Rockton, Ill., the oldest property in the forest preserve district and one of the most popular. Its 228 acres include a campground, shelters, ball fields, a soccer field, boat ramps and canoe access. Also on the river in Rockton, at 2221 Freeport Road, is Macktown Forest Preserve, with 280 wooded acres, a golf course, boat launch and unique historic buildings with programming by the Macktown Living History Education Center. At 338 acres, Atwood Homestead, across the river from Machesney Park, provides a golf course with clubhouse, picnic shelters, two docks, a boat ramp, canoe access and serene views. 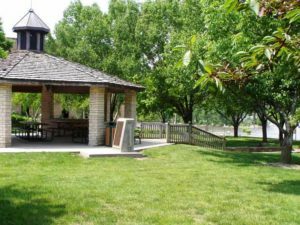 Further south, Rockford Park District operates 13-acre Martin Park in Loves Park, at the foot of the Riverside Bridge. It has a shelter, ball diamond, play equipment, boat ramp and lovely riverbank willow trees. There’s also a lagoon where folks fish in summer and skate in winter. Just a bit futher south is Shorewood Park, 235 N. Evelyn Ave., Loves Park, 35 acres studded with mature oaks, offering picnic areas and a boat launch. Summer performances by the Ski Broncs ski club are staged here. To its south is Illinois Street Park, with more than 6 miles of scenic walkway. On North Second Street, Rockford’s original acquisition now spans both sides of the street. On the east, Sinnissippi Park’s 94 acres include hiking paths, picnic areas, shelters, a band shell and 9-hole golf course. To the west, 25 acres make up Sinnissippi Riverfront Park, with its gardens, century-old lagoon and 32-foot floral clock. The rose garden showcases 2,000 varieties, including each year’s All-American Rose Selection winner. The riverfront area is undergoing a $13 million improvement. Year-round Nicholas Conservatory and Gardens will feature a 21,000-square-foot, sustainable energy conservatory, offering educational programs and exhibits, classrooms and banquet facilities, along with expanded outdoor gardens, new water features, a refurbished lagoon and improved recreational path. The always-busy Rock River Recreation Path began as a 1976 bicentennial project. Those who traverse its 10 miles can follow the river from the Frank Bauer Toll Bridge in Machesney Park, south through Martin, Shorewood and Illinois Street parks in Loves Park, emerging at the north end of Sinnissippi Park in Rockford. Passing behind the YMCA, they can cross the river on pedestrian walkways under the Jefferson Street Bridge or over the State Street Bridge in downtown Rockford. “We have nine parks that provide direct access to, or views of, the river,” says Dimke. Those near the downtown: Davis Park, 330 S. Wyman St., site of the original ford, with 6 acres that include festival grounds and stages; the Library and Luther esplanades for sightseeing; Beattie Park, with historic Indian mounds, a Naval memorial and dock for short-term tie-up; and Joe Marino Park on North Water Street, with a path and community fountain. Further north, at 324 N. Madison St., are Riverview Ice House and Riverview Park, with a variety of amenities. Up and down the river, residents and visitors find opportunities to enjoy the water. To the north is Sportscore One, 1288 Elmwood Road, 147 acres with picnic areas and shelters; playground equipment; ball diamonds and soccer fields; more than 3 miles of paved recreational paths along the river; and a boat launch. Facilities here are all handicap-accessible. To the south is 106-acre Black Hawk Park, 101 15th Ave., with minor-league baseball stadium Marinelli Field; picnic areas and shelters; playground equipment; ball diamonds; basketball courts; and a rugby field. Soon to come is a riverwalk between the Discovery Center Museum and the Burpee Museum of Natural History, both on North Main Street in downtown Rockford. “The museum complex recently completed a fabulous $10 million expansion,” says Dimke. The two facilities now share a Smithsonian-quality hall that’s attracting exhibits Rockford was previously unable to host. Festivals centered on the river include On the Waterfront, the big four-day Labor Day bash billed as Illinois’ largest music festival. Rockford is well known for its giant Fourth of July celebration, where more than 4,000 shells explode over the Rock River. Special performances and seating for both events are offered in Davis Park. This city was established on a horseshoe bend of the river in 1835 by Jared Sanford, who was traveling from Dixon to Midway Village (now Rockford). Other settlers followed, including Lucius Read, whose home would become a way station for weary travelers and a safe stop for escaped slaves traveling the Underground Railroad. The town was named Byron when it received a post office, around 1838. Today, the city’s 3,600 residents enjoy the recreation offered by the river. On the north side is Sunshine Park, with nearly 5 acres of riverfront. It has shelters, picnic tables, grills and a playground. On the south bank is River Park, 8059 N. River Road, with about 20 acres of the more than 700 maintained by the Byron Forest Preserve District. Here, 1 mile of the city’s 7-mile bike path runs so close to the river that it often floods in the spring. During the summer months, free outdoor concerts are held every other Sunday at 7 p.m. at the Heritage Farm Museum, 8059 N. River Road. Wolf would like to see more activities and events centered around the river. Another 11 miles south on Route 2 lies this quaint hamlet, the Ogle County seat since 1836. First settler John Phelps arrived here in 1833, and named this home to Potawatomi and Winnebago tribes “Oregon,” meaning “river of the west.” Its 4,000 residents have great pride in their town, and in the river that runs through it, and take care to acknowledge their significant connections to it. The Oregon Park District maintains more than 130 acres, with parks that provide water access on both sides of the river. On the west side, below a dam, Kiwanis Park offers fishing, a picnic shelter and viewing areas. Located behind Conover Square, a former piano factory that now serves as a charming specialty mall, the park is also the site of the bronze sculpture, “From the Waters Comes My Bounty.” It was the first of 10 that a local group, the Community Art Legacy, is casting and placing around Oregon in as many years; the seventh will be installed this summer. Also on this side of the river is Carnation Park, 1 Webster St., 5 naturalized acres with fishing access, an observation deck and a bike trail that winds its way to the historic Oregon Train Depot. Across the river is 23-acre Oregon Park East, 200 N. River Road, with a ball diamond, basketball court, playground, shelters, picnic tables and grills. An observation deck provides impressive views of both the river and historic downtown Oregon. Boaters and anglers access the water above and below the dam, and bikers and hikers enjoy a paved trail. Across River Road is the Chana School Museum, a restored two-room schoolhouse recently placed on the National Register of Historic Places. Lowden State Park, named for former Gov. Frank Lowden, is also accessed from this side. While its 273 acres provide many amazing views of the Rock River, the most breathtaking is from the site of the famous 50-foot statue, known locally as Black Hawk, the Sauk warrior for whom the 1832 Black Hawk War is named. Picnickers and campers find plenty of facilities at Lowden, along with 4 miles of trails to hike. A boat ramp and docks offer water access. Back on the west side, 3 miles further south on Route 2, is Castle Rock State Park, with bluffs and ravines shaded by a forest canopy. Visitors who climb the winding wooden stairs, all the way to the top of the sandstone butte that gives the area its name, are treated to a spectacular view of the Rock River. Recognized as a significant example of distinctive native flora and geographic history, its 2,000 acres became a state park in 1978. Of those, 710 are designated as Illinois Nature Preserve. It has picnic tables, shelters, playground equipment, grills and 6 miles of walking trails. Two yearly festivals celebrate Oregon’s heritage and natural beauty. The 2nd Annual Oregon Trail Days Festival, July 15-17, will mark the 100th anniversary of Taft’s sculpture and acknowledge the town’s history with authentic teepees, Native American dance, trick shooting and roping, and more. Organizers started the festival last year to raise funds to pay for $400,000 of repairs needed on the statue. During the first weekend of October, Autumn on Parade will mark its 40th year. The two-day, day-only event showcases the area’s homegrown and homemade wares and highlights the autumn beauty of the Rock River Valley. A Duck Dash takes place on the river, and Park East is the site of an antique auto and tractor show. In 1826, adventurers making their way from Peoria – then called Fort Clark – to the lead mines of Galena found this an easy spot to ford the river. In 1829, the first ferry across the Rock River was established here. “Father” John Dixon purchased it in 1830, and gave the town its name. Dixon’s residents take full advantage of that bounty. Downtown, between the town’s two bridges, is the new Heritage Crossing Riverfront, opened last year thanks to persistent efforts, over many years, by members of the Riverfront Commission. Previously used only for parking, these two blocks now offer two levels of paved walkway, benches, umbrella tables, a pavilion, flower beds and amphitheater-style stone steps leading down to the water. A life-sized bronze statue of Ronald Reagan, titled “Begins the Trail,” portrays him astride a horse, facing in the direction of his boyhood home. The sculpture is based on a photo of Reagan riding in a Dixon parade, and is meant to mark his transition from Hollywood actor to political leader. Just across the Peoria Avenue Bridge is Page Park, 45 acres where shelters, picnic tables, ball diamonds, benches and tennis courts complement hiking trails, fishing spots along the bank and a handicap-accessible boat launch. The Dixon Municipal Band puts on free weekly summer concerts in the band shell. Just east of Peoria Avenue, Page Park Drive turns into Lincoln Statue Drive; between it and the river is President’s Park. Its 2 acres mark the place where Abraham Lincoln visited Dixon, camping along the riverbanks as a volunteer soldier during the Black Hawk War. On the non-river side is Lincoln Statue Park, home to the only known statue of Lincoln depicted in military uniform. Also here is the Old Settlers’ Memorial Log Cabin, built in 1894. Further east is Howell Park, 324 Boyd Ave., on 3.5 acres, with a paved walkway, benches and landscaping. A concrete platform allows visitors a bird’s-eye view of water rushing over the dam. There’s also a boat ramp nearby. Just about 4 miles north of here is Lowell Park, established in 1907, with 200 forested acres along the Rock River. It has ample amenities, including two handicap-accessible boat ramps and docks for the many boaters who ski, tube, fish or just relax on the river. Swimming is no longer permitted; young Reagan rescued 77 people during his seven summers working here as a lifeguard. Dixon’s annual Petunia Festival, now 47 years old, occurs over the Fourth of July. In the early ’60s, the Lion’s Club planted petunias along the main thoroughfare, to add curb appeal after the loss of many trees killed by Dutch Elm disease. Today, the bright pink blooms are highlighted by festival. Slated to begin June 30, it will include many activities and a parade. The new Heritage Crossing Riverwalk will host three festival tents and a musical performer each night. Page Park will be lined with carnival rides and attractions, vendor booths, a beer garden and music tent; the culmination is a fireworks extravaganza over the Rock River. For the third year, Dixon will be a stop on Cabela’s King Kat Trail this June. The national sports retailer sponsors the catfish event in 10 cities nationwide to promote fishing. Last year, 164 anglers competed in Dixon, and the winner hauled in a 53-pound whopper. “We had lots of people crowd into Page Park last year just to watch the weigh-in,” says Brechon. “We’ll also host a carp tourney in August, and we’re inviting other fishing derbies to consider Dixon. About 12 miles down river from Dixon, Hezekiah Brink established this settlement in 1834. Rapids here dropped more than 8 inches in a mile, and a limestone riverbed tore up boats, so steps were taken to build a dam and lock to make travel easier. The coming of the railroad sank the plan, but two dams do exist here, about a mile apart. The first, built in 1856 by the Sterling Hydraulic Co., provided power for homes and factories springing up along the river; it still operates today. The second also still produces power, and made a navigable feeder for nearby Hennepin Canal State Park. The limestone that caused problems for boats also created beautiful cliff formations that add to the area’s scenery and recreational appeal, and the dams attract boaters and anglers. This community of about 15,000 enjoys four parks on the river. Oppold Marina, 532 Stouffer Road, is about 30 acres, with a boat launch, fishing, docks with gas pumps and a small store offering snacks, bait and canoe/boat rental. There are shelters, picnic tables, grills and playground areas. Ice fishing is popular here in the winter. Sinnissippi Park is 100 acres overlooking the river on Sinnissippi Road, has parking, picnic areas, grills, two shelters, playground equipment, ball diamonds and disc golf. There are boat docks and fishing on both the river and the Sinnissippi Bayou. Two miles of paved trails allow visitors to observe the bayou’s abundant wildlife. Sinnissippi Mounds, a prehistoric American Indian burial site, is here, too. A walkway across the upper, or Sinnissippi, Dam, allows pedestrians to cross from Sterling to Rock Falls directly across the river. The $1.1 million project, completed three years ago, involved the collaboration of federal, state and local governments and organizations. Its completion spurred construction of a new 5-acre park, at Broadway Avenue and 2nd Street. Just feet away is the Dillon Home Museum, 1005 W. 3rd St., an Italianate mansion built in 1857 and purchased by steel baron Paul Dillon in 1882. Run by the park district, it’s now home to the Sterling-Rock Valley Historical Society Museum. Just below the lower dam is Lawrence Park, 25 acres on an island divided by Avenue G. It offers a boat launch and shelter, picnic tables, grills and fishing. On July 15 &16, the Third Annual Sterling Main Street Blues Fest will feature Saturday performances outside on First Avenue. On April 15 & 16, the first annual Sauk Valley Kite Festival will take place along the Rock River behind Sauk Valley Community College, on Illinois Route 2, between Dixon and Sterling. “It’s a quality of life issue, and we want to find more ways to bring the natural environment and the people together,” says Schuldt. In 1867, Sterling resident A.P. White purchased a tract of land on the riverbank opposite Sterling, laid out a town, and called it Rock Falls. He financed construction of a race that connected to the Sterling Hydraulic Dam, and the new community grew. Rock Falls and Sterling were connected by a toll bridge in 1863 and a free bridge in 1878. Today, cars crossing in either direction on the First Avenue Bridge pass seamlessly from one community’s downtown to the next. Rock Falls has four public sites on the river. “Above the dam is Arduini Boat Launch, named for a former mayor,” says Mike Sterba, director of parks and recreation for Coloma Township Park District. It has boat launches, hard-surface parking, shelters and night lighting. Downtown, between the dams, is Bowman Park, 2 acres of former factory land acquired by the park district in 1984. Just east of the First Avenue Bridge, it features a shelter, stone pavilion with courtyard, walkway, landscaping and electricity. Mexican Fiesta Days celebrate Mexican Independence Day on Sept. 16, with food, dancing and a fair; on Sept. 17, the Fiesta Day Parade crosses from Sterling to Rock Falls, the only parade to span the Rock River. The area’s industrial roots are still apparent all along the banks of the Rock River. In Sterling and Rock Falls, abandoned factories occupy much of the downtown riverside. There’s growing awareness of the river’s important changing role. The BWCVB began as a tourism site for Ogle County; after Lee and Whiteside counties joined, the entity was known as the Rock River Convention & Visitors Bureau. When Carroll County joined in 1992, it became the BWCVB. The transition isn’t always easy. Fewer people are taking the river for granted these days. More are coming out to enjoy it. This entry was posted on Thursday, April 7th, 2011 at 12:00 pm	and is filed under Features, Top Posts. You can follow any responses to this entry through the RSS 2.0 feed. Both comments and pings are currently closed.